Scientists have suggested a different explanation of the effects caused by Planet 9, the hypothesised supermassive planet hiding beyond Neptune. 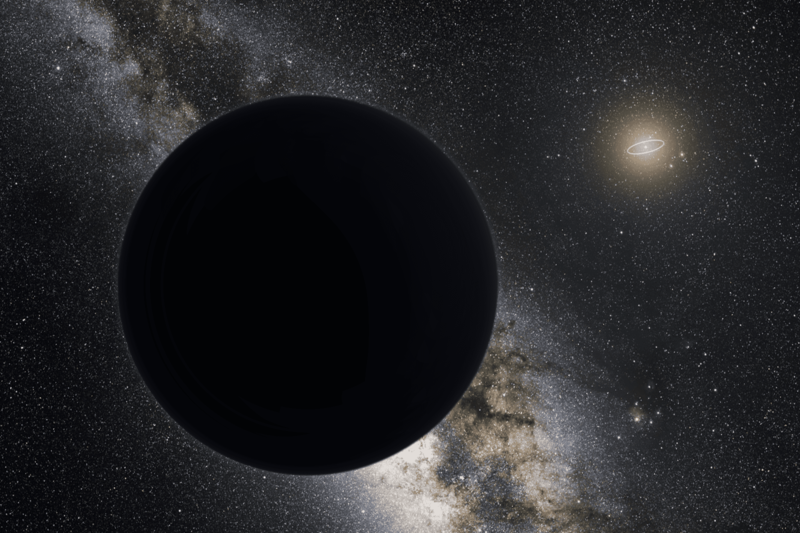 Artist impression of the hypothetical ‘Planet 9’. Credit: Wikimedia Commons. In the last few years, scientists have predicted the presence of a large, hidden celestial body, known as Planet 9, which may be causing disturbances in the outer reaches of our solar system. Now, new research from the Universities of Cambridge and Beirut has suggested something entirely different is out there. Since the discovery of Neptune in the mid 19th century, there have been predictions of other vast objects concealed farther out in the cosmic gloom. In recent decades scientists have observed strange behaviours in some of the TNOs (Trans-Neptune Objects) orbiting the Sun that have so far evaded explanation. There are currently 30 TNOs recorded by astronomers, Pluto amongst them. They are minor planetoids residing beyond Neptune and, like Pluto, some of their orbits are distorted by an enigmatic force – in some cases by as much as 30% ‘downwards’. Some TNOs are even moving through space in the opposite direction to the rest. Such phenomena do not correlate with our assumed 8 planet model of the solar system, and has led researchers in a quest for answers. Recently in 2016, Caltech astronomers Konstantin Batygin and Mike Brown proposed a theory that a massive planet, 10 times the size of Earth, was lying concealed in the depths of our solar system. Far beyond Neptune, Planet 9 (or Planet X as termed colloquially) would receive barely any light to reflect, making any detection from Earth extremely difficult. Its considerable bulk would also exert a strong gravitational force, dislodging objects from the Kuiper Belt, warping their orbits, and even causing the Sun to wobble slightly on its axis. But a new theory published in Astronomical Journal offers an alternative and, as co-author and Cambridge PhD student Antranik Sefilian terms it, a “less dramatic and perhaps more natural” solution. Sefilian and his colleagues suggest that combined gravitational forces from a rotating, icy disc of smaller objects orbiting the Sun are the cause of much of the distortion observed in the outer solar system. Sefilian and his colleagues remain convinced, however, and also alluded to the struggles the team had faced during their investigations. However, with the recent discoveries of other dwarf planets, such as the ‘Goblin’, ‘Sedna’ and ‘Farout’ at the edge of the solar system, Sefilian remains open to the prospect of both the icy disc and Planet 9 coexisting. With more research from astronomers like Sefilian and Brown, hopefully the coming years will shed more light on what exactly lurks around the furthest realms of our solar system.